Johnny Damon will not be returning to Fenway Park. It turns out he loves Detroit too much to leave. 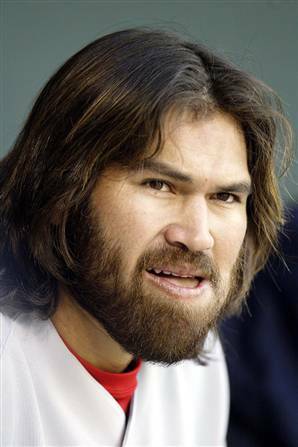 Johnny Damon will not be a savior in Boston. The Tigers’ DH/left fielder turned down a chance to return to the Red Sox because he “loves Detroit”. Before the Tigers’ scheduled game against the Royals, Damon told a crowd of assembled reporters that he was spurning the Red Sox attempts to reacquire because of his affection for the Motor City. Then again, most reports had Damon willing to accept a trade to the Yankees or Rays, so it doesn’t really take a genius to read between the lines. In fact, the meaning is so easy to infer that even a caveman could do it: the prodigal idiot of Red Sox Nation is still unhappy with the way he was treated by both the Red Sox organization and what he likely feels are its ungrateful fans. Ever since he left Boston to join the Yankees after the 2005 season, Damon has nursed an open wound pertaining to the stance that the Red Sox took toward him during contract negotiations. Compounding those hard feelings was the hostile reception Damon frequently received when returning to Fenway, an emotion that was probably rekindled after receiving a standing ovation in his return to Yankee Stadium. If Damon thought Yankees’ fans were still fond of him then, just wait until the next time he returns. Although a very outgoing personality, Damon has also proven to be a very sensitive person. He gives 100% when on the field and goes above and beyond when interacting with fans, so you can see why he would bristle at the negative reception he encounters by virtue of the perception that he is a hired gun. Damon has been the baseball equivalent of a nomad, always searching for a home, so it shouldn’t come as surprise that he decided not to return to a place where he felt he wasn’t wanted. Another lesson to be learned from Damon’s decision is one that won’t go down too easy in Red Sox Nation. More than any group of fans, Red Sox’ rooters throw their support behind management when there is a confrontation with a particular player. It’s almost as if they deem playing in Red Sox Nation to be an undeniable privilege that only a heretic would refuse. From the days of Carlton Fisk through Wade Boggs and Roger Clemens all the way through Pedro Marinez, Damon and Manny Ramirez, a litany of Red Sox stars have left Boston amid acrimony and resentment from the fans. Well, Red Sox Nation was forced to pay the price this time around. Their negative reaction was as much a reason as any that Damon decided to stay with the Tigers. You see, he very well may love Detroit, but it’s also pretty clear that he has no love for Boston.